We have a number of different Bible Study and Prayer meetings each week. All welcome. Sunday 1-4 pm Basic Bible Certificate. This is a 184 lesson Bible Course run over two years, at the completion of which a Basic Bible Certificate is issued. The lessons are not necessarily consecutive, so you may join this class at any time. 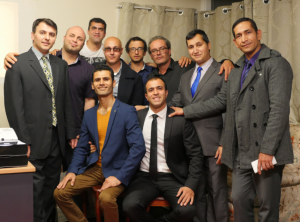 Both English language and Farsi language classes are provided. Child minding and Sunday School lessons for children are available during this class. These classes are led by Keith Piper 0414 106 279 and Matthew Khanzadeh 0404 184 045. Tuesday 5-9 pm Bible College. Classes are in English with Farsi translation. Contact Keith Piper 0414 106 279. Wednesday 7.30 – 9 pm Farsi language prayer meeting at various locations. Contact Matthew for details. The first Wednesday of each month is dedicated to prayer for Iran. Thursday 7.30 – 9 pm Bible Study. Teaching is in English with Farsi translation. Contact Keith Piper 0414 106 279.